The Maritime Archaic tradition was named after the discovery of a 4,000-year-old site at Port au Choix in northwestern Newfoundland. Its name derives from two words: "Archaic", which refers to an ancient pre-agricultural, or hunting and gathering, way of life found throughout eastern North America and "Maritime" for the important role that the sea and its resources played in the lives of Newfoundland and Labrador's first people. Today archaeologists recognize two variants of the Maritime Archaic tradition called the Northern and Southern branches. Northern branch people were the earlier of the two variants to arrive in the province. They are descended from the earliest people along the Labrador Straits and their maritime adaptation is obvious by about 7,500 years ago. Excavation of a burial mound at L'Anse Amour in southern Labrador revealed a walrus tusk, fish bones, a true toggling harpoon, an antler toggle or handle and other objects that indicate a reliance on marine resources by this time. Both the mound and the harpoon are among the oldest in the world. Once established in southern Labrador, Maritime Archaic people continued to spread northward until, by about 5,000 years ago they had reached Saglek and Ramah Bays in far northern Labrador. In the latter area they discovered the source of a distinctive stone called "Ramah chert", from which they fashioned their chipped stone tools and weapons for the next 2,500 years. A series of archaeological "complexes" dating between 7,500 and 3,500 years ago indicates a long in situ evolution along most of the coast of Labrador. Throughout this time, skillfully flaked stone spear points with narrow blades and long, tapering stems for hafting were made from Ramah chert. Other chipped stone tools include knives and scrapers, some of the former of truly impressive proportions. Stone was ground and polished to make axes, adzes and gouges for working wood. Polished slate lance points were used to dispatch wounded sea mammals. Ulus, or half-moon shaped knives, and knives of more familiar forms were used to prepare skins and dress game. We can only imagine what objects were made from bone, antler, ivory wood, skin, bark, and other organic materials. They must have included frames for dwellings, harpoon and spear shafts, tailored clothing, bark and wood containers and many others. Some authorities believe that the Maritime Archaic people may have made large dugout boats in areas where wood was available or could be traded for. Ornaments include cut mica, soapstone pendants, or plummets, and large blades made from Ramah chert that must have served ceremonial, rather than utilitarian, functions. Although very few traces of food bone remain in the acid soils of Labrador, those that have been recovered and the location of Maritime Archaic campsites and villages all indicate a reliance on marine resources. Fish, seals, seabirds, walrus, and perhaps even small whales were hunted regularly. Land mammals, particularly caribou, seem also to have been important for food, antler, bone and skins. At least one large seasonal village, at Nulliak in northern Labrador, seems to have been established for communal caribou hunting. "Drive lanes" consisting of rows of piled rocks may have channeled migrating caribou virtually into the hunters' campsite. In suitable areas houses were made by excavating depressions into boulder beaches. At some sites, where the retreating sea level left a series of raised beaches, house forms can be seen to have evolved from single family dwellings to communal dwellings consisting of a number of "rooms" arranged in a linear fashion along the beach. These dwellings reached their peak at the Nulliak site, where "longhouses" as long as 100m have been discovered. About 4,000 years ago a new people - the Palaeo-Eskimos - arrived in northern Labrador. As these strangers became more familiar with Labrador and continued to expand southward, the Maritime Archaic people seem to disappear at the same time. Although the two events could be coincidental, many archaeologists believe that the Palaeo-Eskimos were more successful in competing for resources and the best campsites. Whatever the cause, the Northern Branch Maritime Archaic people disappear from the archaeological record not long after 3,500 years ago. If any groups survived after that time, their whereabouts has escaped the intensive archaeological research on the Labrador coast. This map shows important, present day archaeological sites. From J. A. Tuck. "Prehistoric Archaeology in Atlantic Canada Since 1975. "Canadian Journal of ArchaeologyNo.6 (1982), p 203. Illustration by Tina Riche. The origins of the Southern Branch Maritime Archaic people are obscure. Shortly before 6,000 years ago a new stone tool complex appears in southern Labrador. The people who made these tools preferred locally-available cherts and rhyolites to the quartz, quartzite and Ramah chert of the Northern branch people. By about 5,000 or 4,500 years ago these people had become established on the coast of southern Labrador and parts of the central coast. They made spear points with broad blades and side-notches for hafting. Flaked knives, scrapers and expedient tools were made from the same local materials. A few sites have produced ground stone axes, adzes and gouges, as well as polished slate spears and lances. Their house types are not known; only traces of stone fireplaces, sometimes arranged in a row along ancient beach terraces, have been found. The Southern branch people were the first humans to colonize the Island of Newfoundland. 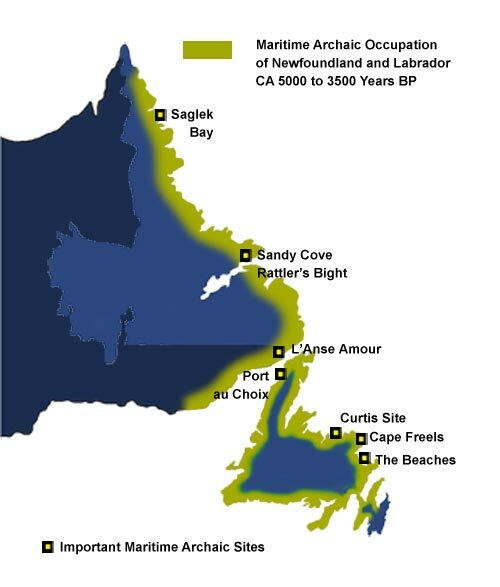 By at least 5,000 years ago they had established themselves on the Northern Peninsula and within a millennium their campsites are to be found virtually around the entire Newfoundland coastline. The most instructive Maritime Archaic site yet excavated is that at Port au Choix where the regular arrival of migrating harp seals each spring provided a reliable and predictable food source. In 1968 a large site containing hundreds of artifacts was excavated. In contrast to most other locations, the soil at Port au Choix permits the preservation of organic material. Artifacts of bone, ivory and antler provide some indication of the elaborate and sophisticated technology of the Southern branch Maritime Archaic people. Toggling and barbed harpoons, bird darts and fish spears of bone and antler, and a series of polished bone and slate spear and lance points, all suggest a technology perfectly suited to the Newfoundland environment. Scrapers and "beamers" of caribou bone, bone awls and fine needles made from split bird bones were used to prepare and sew hides into clothing. Stone gouges, axes and adzes, as well as small chisels and knives made from beaver incisors, were used to fell trees and convert the wood into products that we can only imagine. Many ornaments and magical or religious objects were also found at Port au Choix. The bills and feet of birds, teeth of bears, foxes, wolves and beaver, pins and pendants carved to resemble birds, a bear and even a human form were also recovered. Shell beads, pendants resembling swords and paddles, crystals of quartz, calcite and amethyst and any number of unusually-shaped stones may have served religious, as well as decorative, purposes. Many of these objects relate to the sea, for example a carved stone killer whale, a tooth from the same animal, and depictions of gulls, ducks, loons and the now-extinct great auk. It is difficult to escape the conclusion that certain individuals must have had some special symbolic relationships with these birds and mammals. In general it is hard to escape the conclusion that the Maritime Archaic people were remarkably well adapted to life in Newfoundland - from their technology and economy to their intellectual culture. In central and southern Labrador this successful adaptation seems to have persisted into the succeeding Intermediate Indian and Recent Indian periods. Some archaeologists believe that the Southern branch Maritime Archaic people may have been, in some way, the distant ancestors of today's Innu. Despite the apparent success of the Southern branch people in Labrador, and the apparently well adjusted nature of their culture in Newfoundland, the residents of the Island of Newfoundland disappear from the archaeological record about 3,000 years ago. Archaeologists can cite no convincing influx of a new population at this time, as was the case with the Palaeo-Eskimos in northern Labrador. For the present the disappearance of the maritime Archaic people, and what seems to be a complete absence of Indian people from Newfoundland between 3,000 and 2,000 years ago remains one of the most puzzling mysteries in the Native history of the province. For other Precontact Peoples related articles view the Aboriginal Peoples Table of Contents.